We exceed federal GMP testing requirements. We use independent third party labs to confirm purity, identity, and lack of heavy metal contamination with state-of-the-art testing. Because Just enough is never good enough for us. You can buy a one-time bottle or set up a convenient monthly autoship and save 10%. New autoships place an order immediately and schedule automatic repeat orders every 30 days. Cancel anytime. You can also add single-order bottles to your autoship purchase and enjoy the 10% discount on your entire order. Want two or three bottles up front but only one bottle per month after that? No problem, simply add to cart one bottle on autoship and however many one-time bottles as you want. Then enter coupon code “Autoship Companion” during checkout to receive the discount on the additional bottles. 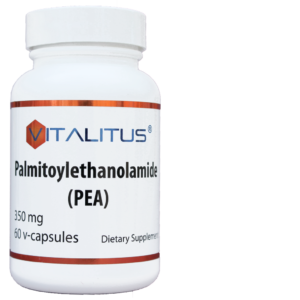 Pharmaceutical grade palmitoylethanolamide (>98% pure). NO synthetic excipients like silicon dioxide or magnesium stearate. Nothing but pure palmitoylethanlamide, natural rice-based anti clumping flow agent, and a natural emulsifier. 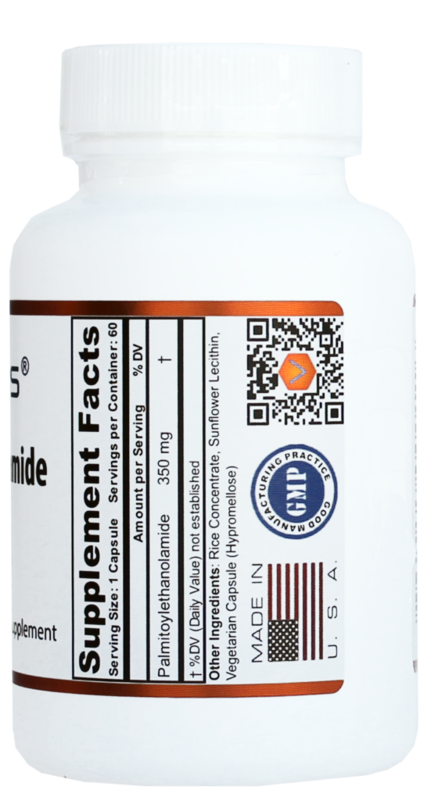 Made with pride in the USA in an FDA Registered GMP facility independently registered with NSF. Take 1 capsule twice daily or as directed by your healthcare professional. When starting PEA supplementation, take four capsules daily for a month as a loading dose. For best result, take with food or lipids. Avoid taking while pregnant or breastfeeding. If adverse reaction develops, report to Vitalitus and discontinue use. 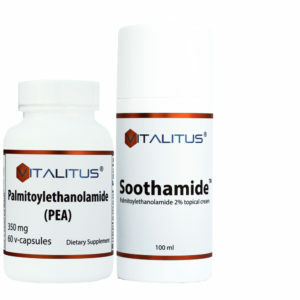 Palmitoylethanolamide (PEA) is an endogenous fatty acid amide. This molecule is a naturally-occurring component of soybeans, egg yolks, peanuts, and a number of other foods. PEA has always been present in the food supply and is marketed as a dietary supplement. Our product is made from the highest quality ingredients right here in the USA in an NSF GMP certified & FDA registered state-of-the-art facility. We eschew synthetic excipients like silicon dioxide and magnesium stearate for this product in favor of a 100% natural hypoallergenic anti-clumping flow aid derived from rice husks. In addition, we use vegetable-derived hypromellose capsules instead of gelatin. 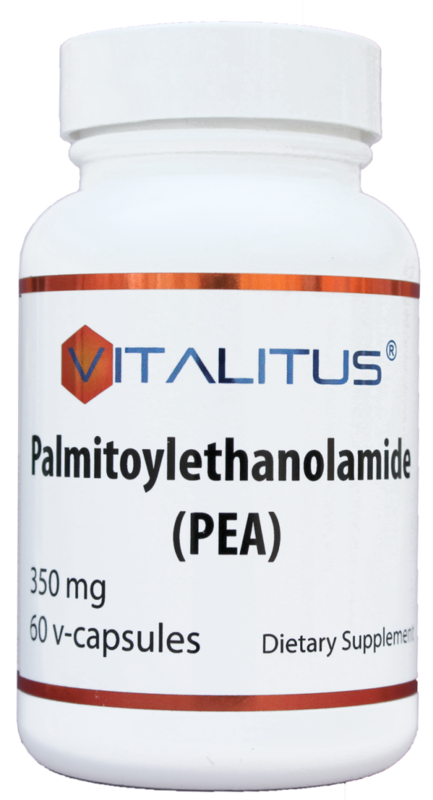 Vitalitus Palmitoylethanolamide contains 350mg of PEA per capsule, 60 capsules per bottle. 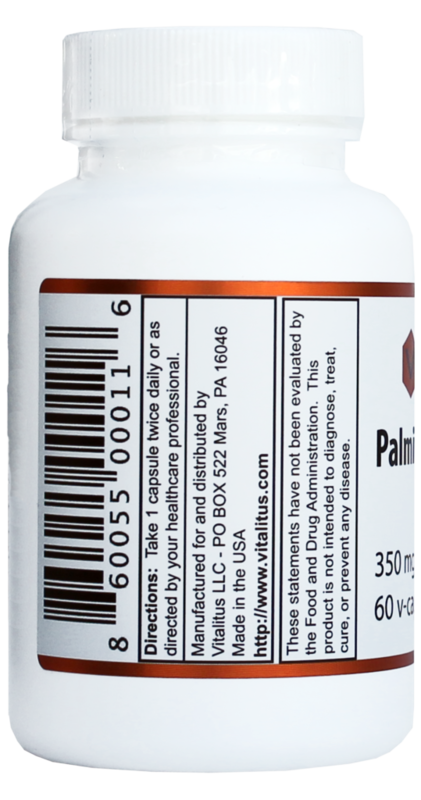 At the recommended dosage of two capsules per day this is a month’s supply for most, however your physician may recommend a different dosing regimen. In some cases our customers see a benefit from consuming 4 capsules a day for two to three weeks when starting a PEA regimen as an initial loading phase before decreasing to the recommended twice-a-day dosing. We’re so sure you’ll love the quality and effectiveness of our product that we offer an unconditional money back guarantee. If you are dissatisfied for whatever reason, feel free to contact us for a refund.